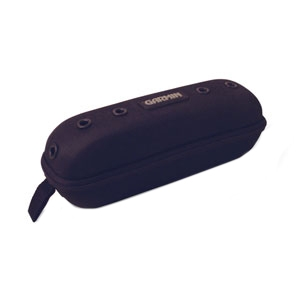 Carrying case (rigid, black nylon with zipper) - Forerunner 50. No more sifting through the contents of a gym bag or backpack looking for your heart rate monitor! This sturdy, zippered case holds your Edge or Forerunner unit along with accessories such as the heart rate monitor strap, charging cradle and USB cable. Great for keeping it all together when you travel. Features air holes for ventilation and end loop for attachment options.